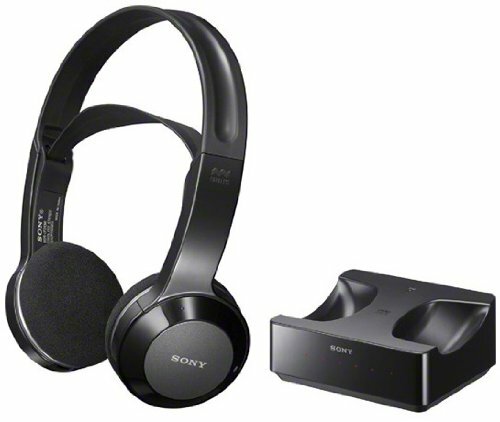 Go Wireless with these Sony Premium Quality Wireless Headphones and enjoy watching TV from as far as 26 feet away!! Relax in the comfort of your couch, favorite chair or lay in your cozy bed and don’t worry about tangled wires or anyone tripping over a unnoticeable wire. Large 40mm Driver Units Deliver Rich, Deep Bass, low distortion and a wider dynamic range. PET Diaphragms ensure high rigidity for minimum distortion. Powerful Neodymium Magnets combine high energy and small size, for ample sound output. Battery charges automatically by placing headphone on transmitter (base). Long Lasting 28 Hours Battery Life with supplied rechargeable NiCad battery. Standard AA Alkaline Batteries Optional (not supplied). Infrared Wireless Transmission works by sending out infrared light signals from the base to the headphones. IR signals are resistant to external noise & interference, but must be within line of sight of the base. Get a 26 foot direct signal range and 13 foot 90° degree angle signal range transmission for uninterrupted listening as you move freely about. Designed for Comfort Wear these lightweight headphones for hours on end with self-adjusting, wide, soft padded headband and open-air design that allows you to continue to hear ambient sound. Power Switch & Volume Control is mounted on the headphones with a LED Indicator light.